Jason Blade (Stazak), William Anderson (Stanton) and his daughter Linda (Megier) are members of a secret warrior clan known as Panthers. Anderson is a member of the Hong Kong Special Branch of Australian law enforcement. While in HK, he, his daughter, and his protege Blade found the time to go through the rigorous martial arts training of the secretive Panther clan. Back in Perth, Western Australia, it seems there is a new bad guy causing all sorts of trouble - the dastardly Damien Zukor (Carman). He’s into racketeering, drugs and any number of nefarious activities, and the ultra-wealthy Zukor has cops and politicians in his back pocket, allowing him to continuously expand his criminal empire, with the help of an army of rubber pig-masked goons brandishing machetes. But he didn’t count on one thing: JASON BLADE. After the murder of Linda by the super-evil number two man to Zukor, Baxter (Richards), Blade decides to go undercover as a thug and infiltrate Zukor’s organization from the inside. Gaining access to Zukor’s world proves complicated, especially when a team of law enforcement officials that disapprove of his rogue ways is constantly tailing him, and he manages a romantic relationship with Anderson’s niece Gemma (Jefferson). Will Jason Blade be the new action hero of the 80’s? Fan-favorite director, Brian Trenchard-Smith here delivers the fun and the silly martial arts/stunt filled goods. Edward John Stazak sadly falls into the camp with Jay Roberts, Jr. and Matt Hannon and never made any other movies (unless you count the made-at-the-same-time sequel, Fists Of Blood (1988). Obviously the filmmakers hope you like the name “Jason Blade” because you hear it many, many times throughout the course of the film. Sinister, Peter Cushing-like bad guy Zukor even gets off a witty, perhaps unintentional one-liner when, impressed with Blade’s intelligence (? ), he tells him, “You’re sharp, Blade”. Blade is a stylish man of the 80’s, but in the slick department, it’s hard to beat Baxter, a man who looks like a cross between David Hasselhoff and Ricky Gervais dipped in a rich, thick coating of eighties. And let’s not forget that this movie came out around the time of the then-current exercise/aerobics boom. There are plenty of scenes in Blade’s gym, including a show-stopping moment involving Gemma. Let’s just say that woman was born to dance. 80’s fashions aside, what’s also good about movies of this time were that you could actually see all the stunts and all the martial arts moves. It might not be the best kung-fu movie ever committed to celluloid but at least there’s no CGI garbage or annoying, eye-irritating “quick cuts”. Actual effort was put forth to make it all come together and the result is quite entertaining. Naturally, there’s an extended, knock-down drag-out fight at the end between Blade and Baxter. Baxter’s main strength as a fighter seems to be his ability to withstand seemingly-endless kicks and punches to the face (although what you see here pales in comparison to what he endures in the follow-up). Harking back to the good old days of cinema good and evil, Blade wears white pants and Baxter black as they gleefully punch away the running time. Featuring the memorable song “Take me Back” by Colin Setches, and released on Celebrity Video in the U.S. (as was its sequel), dare you enter the glorious world of Jason Blade? Really dug the foot chase sequence with Linda and the thugs in the hilarious and ridiculous masks. That was definitely the high point of the movie for me, but the wardrobes were awesomely 80s too. Sounds like fun, will look this one up for sure! Karl: Agreed! This was a ton of 80s fun! The foot chase was well-shot. A Hero Never Dies: Cool! Would be interested in your take on it. 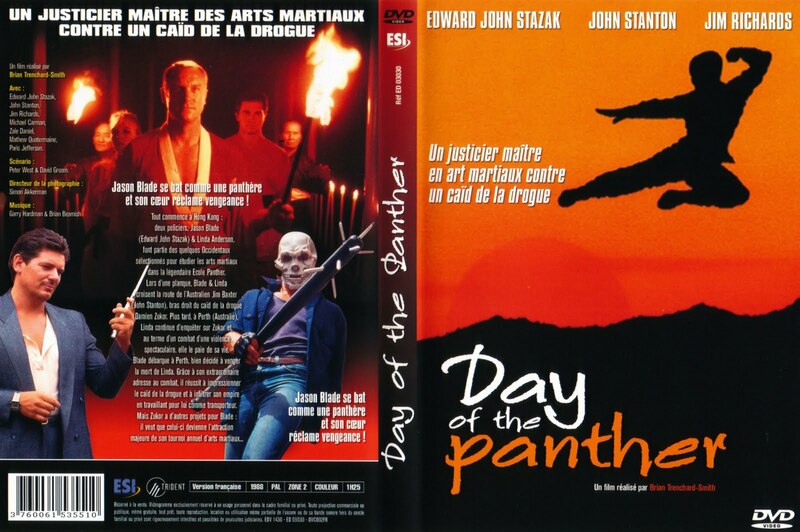 Have you seen the sequel Strike of the Panther? It's very very silly and Stazak makes for a painfully bland lead, but it has a couple of decent fights in it including a finale with some hockey mask wearing ninjas. I think that scene is on YouTube somewhere. Funny you mention that, that is our next review! 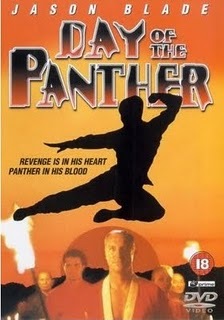 Strike Of The Panther did have some decent fights. I love the Jason Blade movies! They are a lot of fun, Lee! That is pretty cool that they made two of them! The aerobics scene in the gym is an all-time classic. I'm surprised it hasn't been included on one of those studio trailers with the best scenes from 70 years of movies. Haha! Agreed. The gym scene is one of the best. Hilarious!